The title chosen for these lectures, a phrase found in the seventh chapter of the book of Daniel, will indicate the general thesis which I hope to establish, namely, “The Greatness of the Kingdom.” For a long time I have had a growing conviction that much of the disagreement over the subject of the kingdom of God has arisen out of narrow views as to its character. This situation obtains, of course, in more than one department of Biblical theology. Men have gone wrong, not so much in what they affirmed, but rather in what they denied or neglected. This tendency has been given impetus by that natural bent of the human mind, best represented by the philosophers, which impels men to search for one principle or idea that will explain everything else. While this motive, held under legitimate restraints, has often led to fruitful results; it nevertheless is always attended with certain hazards. In the first place, there is the danger of omitting matters of importance which may stand outside our neat little formulas. In the second place, thinking now of the field of Christian theology, this passion for oversimplification may cause men to miss the richness and infinite variety of Christian truth in the interest of a barren unity. It was William James who once suggested that, considered from a certain abstract viewpoint, even a masterpiece of violin music might be described as “the scraping of horses’ tails over cats’ bowels!” Such a definition of course has the merit of simplicity; it gets rid of all the mystery of personality and genius, but the residue is not very interesting. Now I feel strongly that the Biblical doctrine of the kingdom of God has suffered considerably from this tendency toward oversimplification. Men have forgotten the greatness of the kingdom, its richness and complexity, in the interest of their own partial and inadequate explanations. What I am saying is underscored by the very small place given to the subject of the kingdom in some well-known and honored works by conservative theologians. For example, in the books on Systematic Theology by A. H. Strong, Wm. G. T. Shedd and A. A. Hodge one looks in vain for even any mention of the term kingdom in their indexes. It is to the everlasting credit and honor of my dear friend, the late President of Dallas Theological Seminary [Dr. Lewis Sperry Chafer] that in his own excellent Systematic Theology he was able to make such a large and important contribution to this particularly needy field of theological science. It should be axiomatic that any conception of the kingdom of God which rests in large part upon a certain interpretation of a single text or passage of the Bible is to be regarded with deep suspicion. In this category are the systems built around such passages as “the kingdom of God is within you” (Luke 17:21), or “I will give thee the keys of the kingdom of heaven” (Matt 16:19), or the parable of the leaven (Matt 13:33), or the ethical precepts of the sermon on the mount (Matt 5—7), or even Revelation 20. The doctrine of the kingdom should be determined by an inductive examination of all the Biblical material on the subject, and it should not have to stand or fall by the inclusion or exclusion of isolated passages where interpretations may be in serious dispute. To me there is no question as to the general meaning of Revelation 20, but I maintain that the essential outline of the Biblical doctrine of the kingdom can be established without it. And this doctrine, once established, should be our surest guide in our approach to the passage under controversy. Let me begin the discussion with a tentative definition. A kingdom involves at least three things: first, a king who rules; second, subjects who are ruled; and third, the actual exercise of the function of rulership. I do not think that much attention need be paid to the effort to show that the term kingdom refers to a bare divine sovereignty. The great ideas of the Bible are concrete rather than abstract, and such terms as the kingdom of God are intended to convey meanings which are pertinent to actual situations in the world of reality with which men are somewhat familiar. On the basis of the above analysis, the kingdom of God may be defined broadly as the rule of God over his creation. Now it should be clear that this phrase the kingdom of God has no precise meaning or authority apart from the content assigned to it in the Holy Scriptures. Therefore, passing over for the moment the various theories (and they are many), let us attempt to establish its content on the basis of an inductive study on the Biblical material out of which the original idea arose. In examining the very extensive array of references, especially in the Old Testament, we are immediately impressed by a series of differences which at first seem almost contradictory. In the first place, it appears that the kingdom is something which has always existed; yet it also seems to have a definite historical beginning among men. Second, the kingdom appears as something universal outside of which there lies no created thing; yet again the kingdom is revealed as a local affair beginning on earth. Third, the Kingdom appears in Scripture as the rule of God directly; yet it is often pictured as the rule of God through a mediator who serves as a channel between God and man. Fourth, the divine kingdom is set forth as an unconditioned rule arising out of the sovereign nature of Deity itself; yet on the other hand it often appears as a kingdom based on a covenant made by God with man. Some of these distinctions, if not all, have been noticed by various Biblical scholars, and attempts have been made to explain them; either by asserting the existence of one kingdom with two aspects or phases, or by the assumption of two separate kingdoms. 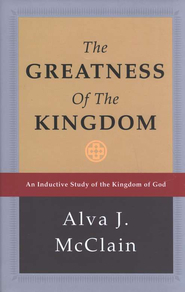 For example, Hengstenberg distinguishes between a “kingdom of power” and a “kingdom of grace.” And Peters speaks of the one as “God’s universal, general sovereignty exercised by virtue of his being the creator,” while the other is the “Theocracy” or “Theocratic Kingdom.” Recently we have seen the rise of a school of opinion, somewhat anti-intellectual in character, which, rejoicing apparently in the existence of religious paradox and tension for their own sake, is content to leave all such antinomies permanently unresolved. For myself, while recognizing the reality of these Biblical distinctions, I am also convinced that the Scriptures offer a reasonable explanation. In one sense it would not be wholly wrong to speak of two kingdoms revealed in Scripture. But we must at the same time guard carefully against the notion that these two kingdoms are absolutely distinct one from the other. There is value and instruction in thinking of them as two aspects or phases of the one rule of our sovereign God. In seeking for terms which might best designate these two things, I have found nothing better than the adjectives universal and mediatorial. They are not commensurate terms, of course, but describe different qualities, the first referring to extent, the latter to method. Nevertheless, in each case the designated quality seems to be the most important one from a descriptive standpoint. As we proceed with the discussion, therefore, the terms used will be the universal kingdom and the mediatorial kingdom. This universal kingdom is something which has always existed. Thus we read that Jehovah is “King forever and ever” (Ps 10:16). Again, describing the progress of a storm sweeping in from the sea across the land, breaking down the cedars of Lebanon, the Psalmist declares that God is in this violence of nature sitting as “King forever” (Ps 29:10). As a precious comfort in the midst of desolations brought by judgment, the Old Testament saint could say, “God is my King of old” (Ps 74:12). And the prophet Jeremiah bears a like testimony to the everlasting character of the divine rule, affirming that “The Lord is the true God, he is the living God, and an everlasting king” (Jer 10:10). And in the midst of his lamentations the same prophet finds a kingdom of God grounded in the eternal nature of God himself, saying, “Thou, O Lord, remainest forever; thy throne from generation to generation” (Lam 5:19). This kingdom is universal in the most complete sense of that term. Nothing lies outside its reach and scope. It includes all things in space and time, in earth, in heaven and in hell. Jehovah is the “King of the nations” (Jer 10:7). Witnessing to the present reality of that universal kingdom in his own day, the Psalmist writes, “The Lord hath prepared his throne in the heavens; and his kingdom ruleth over all” (Ps 103:19). Nebuchadnezzar, golden head of an ancient world empire, is cut down from his throne by divine judgment in order that “the living may know that the most High ruleth in the kingdom of men, and giveth it to whomsoever he will, and setteth up over it the basest of men” (Dan 4:17, 25, 32). David the king, although reigning over a small nation in a small land, sees and speaks of a greater kingdom, “Thine, O Lord, is the greatness, and the power, and the glory, and the victory, and the majesty; for all that is in the heaven and in the earth is thine; thine is the kingdom, O Lord, and thou art exalted above all. Thou reignest over all” (1 Chron 29:11–12). The rule of this kingdom operates generally through second causes; that is, what theologians have sometimes called the rule of ordinary providence. Thus the Assyrian monarch is a “rod” in the hand of Jehovah to accomplish his divine purpose in judgment against Jerusalem, though the king knows it not and has no intention to serve God (Isa 10:5–15). Likewise, the King of Babylon is God’s “servant” for the accomplishment of his will (Jer 25:9). In the sequence of the rise and fall of world empires, it is Jehovah who raises up and prepares the “Kings of the Medes” for the destruction of Babylon (Jer 51:11, 28–37). Long before his birth, the great Cyrus is named prophetically and then “anointed” to fulfill the purpose of Jehovah in rebuilding, his holy temple (Isa 44:28–45:4). At exactly the crucial moment a fit of insomnia disturbs the rest of the Persian Xerxes, causes him to call for the chronicles of his kingdom (something like our own Congressional Record), and the outcome of this seemingly insignificant incident is the rescue of Israel from national extermination, together with all the irreparable losses such a disaster would have entailed (Esth 6:1–8:17 ). Upon special occasions and under certain circumstances the rule of God in this universal kingdom may operate directly through divine miracles. Without attempting just now to draw the precise line between what is called the natural and the supernatural, I mean that God.may break into the so-called closed system of nature (which of course He upholds and controls) with great exhibitions of his unveiled power. The Bible writers are never conscious of any necessary conflict between the divine rule through the system of nature and that through the miraculous. In both they recognize the hand of the same sovereign God who is transcendent as well as immanent. Thus we read that “Whatsoever the Lord pleased, that did he in heaven, and in earth, in the seas, and all deep places. He causeth the vapours to ascend from the ends of the earth; he maketh lightnings for the rain; he bringeth the wind out of his treasuries. Who smote the firstborn of Egypt, both of man and beast. Who sent tokens and wonders into the midst of thee, O Egypt, upon Pharoah, and upon all his servants” (Ps 135:6–9). Here we have both nature and miracle. But in general, especially with reference to the earth, the method of divine control in this universal kingdom is through second causes—”Fire and hail; snow and vapour; stormy wind fulfilling his word” (Ps 148:8). The kingdom of God in this universal sense exists regardless of the attitude of those under its rule. Some personal beings, the elect angels and the true people of God, have bowed in submission. Others, as in the case of the Egyptian king, are actively opposed to the revealed will of God. Still others, as the Assyrian of Biblical history, know nothing about the divine rule of such a kingdom. Nevertheless, we are told in Scripture, the Lord worketh all things after the counsel of his own will. Even if there were in all the universe not one solitary personal being not in rebellion against God, (whether angel or demon or man); even if there were no heaven of the redeemed but only a hell of the lost—it would still be true of this universal kingdom that “The Lord hath prepared his throne in the heavens; and his kingdom ruleth over all.” This kingdom is an ever-present reality from which there can be no escape. In the light of these facts, it becomes clear that this universal kingdom could not have been precisely that kingdom of God for which our Lord taught his disciples to pray, “Thy kingdom come.” For in the universal and providential sense, the kingdom of God has already come and the will of God is being done on earth. This rule of God, in fact, has always existed and has never been abrogated or interrupted. The key to the real meaning of the so-called Lord’s Prayer must be found in the clause, “as it is in heaven.” Although the kingdom of God ruleth over all, there is a profound difference between the exercise of its rule “in heaven” and “in earth.” This difference arises out of the fact that rebellion and sin exist upon the earth, sin which is to be dealt with in a way not known in any other spot in the universe, not even among the angels that fell. And it is precisely at this point that the great purpose of the mediatorial kingdom appears: On the basis of blood redemption it will put down at last all rebellion with all its evil results, thus finally bringing the kingdom and will of God on earth as it is in heaven. When this purpose has been accomplished, the mediatorial phase of the kingdom will finally disappear as a separate entity, being merged with the universal kingdom of God. With this rather brief survey, of the universal kingdom, I shall now turn to a consideration of the mediatorial phase to which the Biblical writings give the vast, preponderance of attention. You should understand that during the remainder of our study, to save repetition, the term kingdom will invariably refer to its mediatorial phase,unless otherwise stated. The mediatorial kingdom may be defined tentatively as the rule of God through a divinely chosen representative who not only speaks and acts for God but also represents the people before God; a rule which has especial reference to the human race (although it finally embraces the universe); and its mediatorial ruler is always a member of the human race. I shall trace the development of this kingdom as it appears imperfectly realized in Old Testament history; present its future form as forecast in Old Testament prophecy; its character as announced by our Lord in the period of the Gospel records; its place in the history of the apostolic period covered by the book of Acts; the peculiar form in which it exists during the present Christian church era; its visible and established form in the millennial age; and finally its mergence in and complete identification with the eternal and universal kingdom of God. Attempts have been made to erect an absolute separation between the historical kingdom and the future kingdom of prophecy; but that there is a vital connection between the two should be clear from many passages with which we shall deal in later lectures. Certainly, the future kingdom is to be a revival and continuation of the “throne of David.” In a very real sense there is but one mediatorial kingdom of God. But where historically did this idea of mediatorial rule originate? Let us review briefly its background. In Eden the newly created man cast off the rule of his Creator, arrogating to himself the perilous right to decide for himself what was good for him and his posterity. This attitude seems to characterize the early pages of human history, brief as the record is, so that Cain the fratricidal killer is not brought to the bar of human government to answer for his terrible deed. And Genesis 6:5 records the only possible end to such an era—universal, wilful and unrestrained wickedness. Following the divine judgment of the flood we have something new: the institution of human government by divine decree. Here again the record is brief, but its basic principle lays the foundation for all human law and government—”Whoso sheddeth man’s blood, by man, shall his blood be shed, for in the image of God made he man” (Gen 9:6). This is not a law of personal vengeance, as some have claimed. The punishment of the murderer is to be inflicted “by man” in the collective sense. The moral justification for capital punishment is found in the very argument sometimes used to oppose it, namely, the preciousness of human life in God’s sight. Human government exists for only one reason—the protection, conservation and fostering of human life. But the establishment of human government by divine decree with its salutary principle for the conservation of life did not succeed. Things did not grow better but worse in certain respects, resulting finally in the judgment at Babel. The mediatorial idea appears incipiently among the patriarchs. Following the confusion of tongues and the scattering of mankind throughout the earth, God turns away from “man” in the collective sense and calls out one man through whom he will accomplish his will on earth (Gen 12:1–4). In Abraham and Isaac and Jacob the mediatorial idea begins to take form historically in miniature. God speaks to these men and they in turn mediate the divine will, although often very imperfectly. The Genesis record indicates that within the scope of their own families the patriarchs were genuine mediators through whom God ruled in the chosen line of humanity. These men were almost absolute monarchs in their own households which included not only their own progeny but also servants, retainers, and fighting men( Gen 14:14). In their hands rested the power of life and death, as may be seen in the offering of Isaac (Gen 22). The mediatorial kingdom began in historical form with Moses and continued under the early great leaders who followed. This period is marked by the mediation of God’s rule through Moses, Joshua, the judges, and Samuel. At first thought it may seem strange to have a kingdom without a king. But we must remember that in this kingdom it is God, not man, who rules. Crude as were some of his ideas, Gideon was right about one thing: “I will not rule over you,” he said to the men of Israel, “the Lord shall rule over you” (Judg 8:23). And speaking of that long and remarkable period extending from Moses to Saul, Samuel characterizes it to Israel as an era “when the Lord your God was your king” (1 Sam 12:12). During this period the great leaders of Israel were in all cases chosen by divine appointment and invested with authority to speak and act for God within the scope of their prescribed responsibilities. Moses was to be to Aaron and the people “as God” (Exod 4:16, A.S.V. ), a divinely appointed authority which was underscored in terrible fashion by the judgment upon Korah and the rebels who questioned it (Num 16). Joshua was invested with the same mediatorial authority by the word of Jehovah: “As I was with Moses, so I will be with thee” (Josh 1:5). Of the great leaders who followed, it was said, “The Lord raised up judges,” and judgment fell upon Israel because “they would not hearken unto their judges” (Judg 2:16–17). Of Samuel it was written, “The Lord was with him, and did let none of his words fall to the ground,” and his word “came to all Israel” (1 Sam 3:10–4:1). In Samuel we have the connecting link between the period of Israel’s great leaders and the period of her kings. But through it all there is a kingdom, and this kingdom is God’s. The constitution and laws of the kingdom were given at Sinai. Altogether too little attention has been given to the many faceted nature of the mediatorial kingdom in history as revealed by the Mosaic code. The limits of these lectures do not permit an adequate discussion of its bearing on matters which are ethical, social, ecclesiastical, political and physical; save to remark that these provisions could still be studied with great profit by modern political and social scientists. This will not surprise the informed premillennialist, of course, since he knows that we have here the foundations of a future millennial kingdom. But there is one thing which is often overlooked, namely, the spiritual aspect. For it is not wrong to say that the historical kingdom was also a spiritual kingdom. This can be shown by a study of the Pentateuchal material in the light of the Biblical meaning of the term spiritual. It is high time that this perfectly good term should be rescued from the abuse it has suffered at the hands of theologians who, either consciously or otherwise, are under the spell of Platonic philosophy. This point will be discussed in a later lecture. The mediatorial kingdom in history reached the pinnacle of its glory under the first three kings. Each, one of these men held his throne by the decree and appointment of Jehovah. The entire monarchical career of Saul is summarized by the prophet Samuel in two brief statements, both addressed to the king: first, “The Lord anointed thee king over Israel,” and second, “The Lord hath rejected thee from being king over Israel” (1 Sam 15:17, 26). In the stead of Saul, it is Jehovah again who exercises his right of sovereign choice in the case of David (1 Sam 16:1, 13). And David, speaking as a prophet to whom the word of the Lord had come, thus indicates the divinely chosen line of succession, “Of all my sons (for the Lord hath given me many sons) he hath chosen Solomon my son to sit upon the throne of the kingdom of the Lord over Israel” (1 Chron 28:5). It is significant that Solomon, the last of the kings directly chosen by Jehovah, is also the last king of the united kingdom of Israel. Now it has been suggested that the setting up of kings over Israel meant not only a popular rejection of theocratic rule but also its end in history. Such a view cannot be sustained by any careful study of the Biblical record. As a matter of fact, the monarchical form of the mediatorial kingdom had been clearly delineated in prophecy. To Abraham, and also later to Jacob, it was said, “Kings shall come out of thee” (Gen 17:6; 35:11). Not only so, but in Deuteronomy some important rules were laid down for the selection of the kings as well as for their conduct politically, morally, socially, and spiritually (17:14–20). Still further, in giving prophetic directions for the succession of Solomon on the throne of Israel, David carefully guards against any misunderstanding. Solomon may indeed sit upon the throne, but the kingdom is still “the kingdom of the Lord over Israel” (1 Chron 27:5). Let us now review quickly the events leading to the monarchical form. Following the death of Joshua and the elders that outlived him, there was a swift moral and spiritual deterioration in Israel. But after the manner of sinful men in all ages, instead of seeing the source of the trouble within themselves, they made the mistake of supposing that a change of governmental form would solve their problems. First, they tried to set up Gideon as a king, but their proposal was rejected by Gideon who insisted that “The Lord shall rule over you” (Judg 8:22–23). Their folly persisted, however, and finally they demanded a king (1 Sam 8:5); to which demand the God of Samuel assented (8:19–22), only reserving to himself the right to choose the king (10:17–24 ). that it deserves fuller attention than can be given in these lectures. In this brief record we are told how God gave the people their own desire for a government like the nations, and at the same time outlined prophetically the inevitable trend of all such government. The real point does not so much concern the mere political form of government, but rather the desire of the people to exchange a simple theocratic government, based on moral principles and dedicated to the general welfare, for what would become a great top-heavy governmental machine dedicated chiefly to its own perpetuation. First, in wanting a government like the other nations, they took the first step toward the wrong kind of internationalism. Second, a permanent government service would begin, both civil and military in character. Third, this would lead to a bureaucracy swollen by job-making. Fourth, the unnecessary expansion of government service would produce labor shortages in productive pursuits. Fifth, after this they would get government for its own sake. Sixth, such government would demand heavy taxation to support it. Seventh, increasing taxation would lead to the confiscation of private property. Eighth, much of this wealth would go to the partisans of the government. Ninth, at last all the people would become servants of the state. Tenth, the end result would be intolerable oppression and deep distress. Can any thoughtful student of government in our times fail to see these very trends in the world of nations—yes, even in our own land of the free? The decline of the mediatorial kingdom in Old Testament history. With the death of Solomon catastrophe struck the chosen nation. Israel was ruptured by a secession of the northern tribes which established their own government. But this did not mean the end of the kingdom in history. As H. C. von Orelli rightfully observes, “The smaller and often overpowered kingdom of Judah, which faithfully adhered to the royal line of David, passed through many crises and had many unworthy rulers. But the legitimate royal house, which had been selected by Jehovah, constituted spiritually a firm bond which kept the people united, as is seen, e.g., by a glance at the addresses of Isaiah, who is thoroughly filled with the conviction of the importance of the House of David, no matter how unworthy the king who happened to rule appeared to him.” As the dying Jacob had said, “The sceptre shall not depart from Judah” (Gen 49:10). But the period of decline had begun, a period characterized by a more indirect mediation of the rule of God. There had been prophets before, but now they appear with greater frequency. Whereas Jehovah had often spoken directly to the great leaders and kings of Israel down to Solomon, now prophets become the immediate spokesmen of Deity, communicating his will to the kings, who sometimes obey. In the divided nation the kings take the throne either by inheritance or by force, and there is swift degeneration with notable exceptions. At the same time the prophets predict disaster and a future kingdom where God will mediate his rule through a righteous king who, like Moses, will be invested with the functions of both prophet and ruler. The close of the mediatorial kingdom in history is dramatically recorded in the book of Ezekiel. The Glory of Jehovah, often referred to in the Old Testament, and called the Shekinah in non-Biblical Jewish writings, was more than a mere symbol of God’s presence. It was indeed a “sign and manifestation of his presence” but it also described “the form” in which God revealed himself. Doubtless we are justified in seeing manifestations of this glory in such phenomena as the burning bush and the pillar of cloud and fire, but there can be no question as to its appearance on the Mount of Sinai where, we are told, “The Lord descended upon it in fire” (Exod 19:18). And when Moses went up by divine command, the inspired record declares that “the glory of the Lord abode upon Mount Sinai” (Exod 24:15–16). It was here that the historical kingdom received its divine constitution and laws, and when the tabernacle had been completed according to directions, we read that “the glory of the Lord filled the tabernacle” (Exod 40:34). Thus the glory became the visible evidence of God’s presence and rule in the kingdom of Israel. The departure of this same glory is described by Ezekiel under the most dramatic of circumstances, and indicates, I think, the definite close of God’s mediatorial kingdom in history (cf. 8, 9, 10 and 11). The prophet is sitting among his people captive in Babylon on the banks of the Chebar, when he is lifted up by the Spirit and brought in his visions to Jerusalem. There, in spite of the dreadful apostasy unfolded before his eyes, he sees “the glory of God” still in the city of David in its proper place (8:4). A little later an the vision, the prophet sees that “the glory of the God of Israel was gone up…to the threshold of the house” (9:3). There, he writes, “the glory of the Lord…stood over the threshold” for a moment, illuminating even the court with the ineffable “brightness” of Deity (10:4). “Then the glory of the Lord departed from off the threshold of the house” and stood above the cherubim “at the door of the east gate” (10:18–20). Finally the cherubim lifted up their wings and the prophet records the tragic end: “The glory of the Lord went up from the midst of the city, and stood upon the mountain which is on the east side of the city” (11:23). Later on the city of Jerusalem was rebuilt, and within its walls successively two temples were built, but you will read of no glory therein. The immediate presence of Jehovah was departed. But there was something wonderfully gracious in the circumstances of God’s withdrawal. Not suddenly, but slowly, with tender reluctance, as if God were actually yearning to remain. But there was no entreaty or repentance on the part of the people as a nation. The elders of Israel go on bowing down to their idols, the women weep for Tammuz, the priests stand with their backs toward the temple of God and worship the rising sun (8:4–16). God is forgotten. And when God is forgotten, the glory is departed. Yet even in the midst of this melancholy vision, we may read the inspired promise that God will be a refuge to Israel during her scattered and dispersed condition (Ezek 11:16). This promise, however, is not something wholly apart from moral and spiritual attitudes. If God will continue to be a “sanctuary” to Israel, it is also true that to many in the nation He will also be a “stone of stumbling” and a “rock of offence” (Isa 8:14). Furthermore, to the same prophet who saw the departure of the glory and the end of the kingdom in history, the Lord graciously gave a vision of the future return of the glory (Ezek 43:1–7). Just as the Lord’s glory departed by way of “the door of the east gate,” even so the glory will again return: “Behold, the glory of the God of Israel came from the way of the east,” and “the glory of the Lord came into the house by the way of the gate whose prospect is toward the east” (43:2, 4). As to the general meaning of all this there can be no misunderstanding—the glory will return, the kingdom will again be established on earth, in the city of Jerusalem. Here, the voice of Jehovah declares, is “the place of my throne…where I will dwell in the midst of the children of Israel forever” (43:7). And if historically the final appearance of the glory was “upon the mountain which is on the east side of the city” (Ezek 11:23), even so the glory will return in the Person of our Lord Jesus Christ. “His feet shall stand in that day upon the Mount of Olives, which is before Jerusalem on the east…and the Lord shall be king over all the earth” (Zech 14:4, 9). First, there was a lack of spiritual preparation on the part of the people. No government can wholly succeed among men unless there exists a sufficient body of its citizens who are in inward harmony with its laws. We are constantly in danger of forgetting the importance of this principle. To cite a rather recent instance—many of the people who helped to pass the 18th Amendment, because they thought it would be good for the nation, were personally not in harmony with the law for themselves. And so the end was dismal failure and repeal. I am not suggesting the possibility of any ultimate failure of the divine government. But even in the kingdom of God, its citizens are not all robots to be controlled mechanically by irresistible power. A second defect of the historical kingdom was the imperfection of those through whom the rule of God was mediated. It is an axiom of political science that no government can be more perfect than its rulers. It will not be necessary to review the lamentable record of even the best of Israel’s leaders and kings: David with his double crime against society and against God; Solomon with his final violation of the most important regulations of the mediatorial economy. The important fact is that in the midst of the darkness of failure on the part of both people and rulers in the historical kingdom, the prophets bid us look forward to a better age when these two defects shall be remedied; an age when the laws of the kingdom will be written in the hearts of its citizens (Jer 31:33), and its mediatorial Ruler will be perfect in his character, wisdom and ways (Isa 11:1–4). It should be observed that the independence and success of the Jewish state is inseparably bound up with the divine re-establishment of the mediatorial kingdom. The Maccabees made one of the most desperate and heroic attempts recorded in all human history to re-establish the Jewish state, and failed. All other attempts, through political and military means alone, will also fail. It must wait for a supernatural intervention on the part of God, just as it began in history with such an intervention at Sinai. “The children of Israel shall abide many days without a king” (Hos 3:4). Article above adapted from BSac 112:445 (January 1955), pp.12-28. Alva J. McClain, the founder and first president of Grace Theological Seminary and Grace College, was born in Iowa and later grew up in Sunnyside, Washington. Shortly after his marriage to Josephine Gingrich in 1911, he and his wife were saved under the preaching of Dr. L.S. Bauman. He had been attending the University of Washington, but removed to Los Angeles, where he attended the Bible Institute of Los Angeles and sat under the teaching of Dr. R.A. Torrey. Upon graduating from Biola, he enrolled in Xenia Theological Seminary and completed work for the B.D. and Th.M. degrees–following which he was called to the First Brethren Church of Philadelphia, where he served from 1918 to 1923. During the pastorate he taught at the Philadelphia School of the Bible. Because of ill health, he resigned and removed to California, where he finished his work for the A.B. degree at Occidental College, graduating as valedictorian. Later he was awarded the honorary degree of LL.D. at Bob Jones University, and the D.D. degree at the Bible Institute of Los Angeles. In 1925 and 1926, he served as professor of Bible at Ashland College. 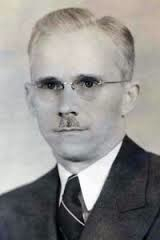 In 1927-1929 he taught Christian theology at the Bible Institute of Los Angeles. In 1930, the first graduate school of theology in the Brethren Church was organized at Ashland College under his leadership, where he served as its first academic dean and professor of Christian theology. In 1937 Grace Theological Seminary was organized under his direction, and as first president and professor of Christian theology, he served from 1937 to 1962. Dr. McClain authored many short treatises, but will be remembered for his monumental work on Christian theology, The Greatness of the Kingdom, one of seven volumes he had projected concerning the entire scope of Christian faith. He will long be remembered as scholar, theologian, educator, master teacher, and Christian gentleman. This helps me a lot. Thank you for posting! I sit under Dr Stan Toussaint. He is Professor emeritus from Dallas Seminary. He attended these Alva J McClain while a seminary student and still holds this future only Kingdom view. I also graduated from Grace College. A rich heritage. Hello, this is taken from the book The Greatness of The Kingdom? or from other source?. Thanks for sharing! Yes – it is from the Greatness of the Kingdom…hopefully they will keep reprinting this classic – it’s still not available electronically.